Last Sunday Susi and I headed over to what’s probably the best known urban exploration location in Helsinki, Kruunuvuori. It’s an area with a bunch of wooden villas that date from the early 20th century (some, perhaps, from late 19th century), and which have been variously occupied and abandoned throughout the years. All of them are now slowly falling prey to the forces of nature and teenage hormonal idiocy. The day was beautiful and crisp, excellent for exploring a place like this – except for all the people who were on a Sunday walk with their dog in the forest, on one of the roads skirting the seaside. Right at the first house we ran into a group of middle-aged people, who had bought a book about the history of the area, and were checking out the houses. Around the turn of the century the area was bought by the son of the founder of the Finnish school system, Johan Cygnaeus, who sold it to German consul Albert Goldbeck-Löwe, who apparently built most of the villas. After the WWII the Germans had to leave, and the area was annexed by Soviet government, who made it a holiday paradise for Finnish and Soviet high level communists. Later the area was bought by a developer, whose plans of rebuilding it got shelved, and he just left the villas to rot while fighting for the right to build the area. Neverthelss some of the houses have been inhabited ’till the late 80’s, or used by certain clubs and societies. 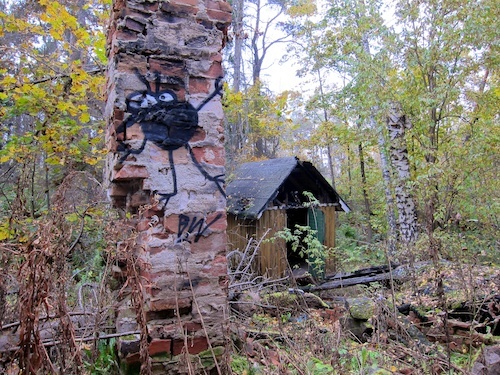 This place, called Villa Hålvik, was burned about three years ago. A lot has happened since I visited the place last time, two and a half years ago. 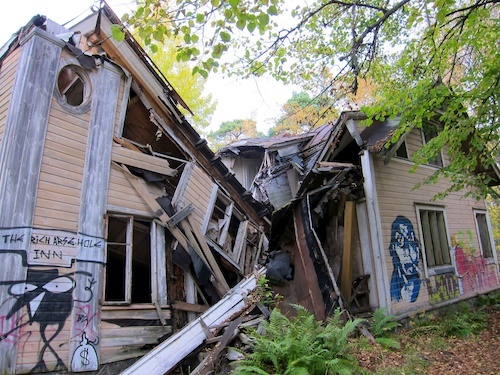 Villa Kissinge, which I called the Moomin house before knowing its name, had more or less fallen apart. The last time it was possible to walk around the upstairs, although the stairs were elastic and squishy in a rather disconcerting way, but now the mid-part of the building had fallen in. The upstairs floor felt really rickety, and I explored a bit by trying to avoid contact with the middle of the floor by spider-walking, and trying to find beams under the floorboards, but after a while it started feeling like a really bad idea. 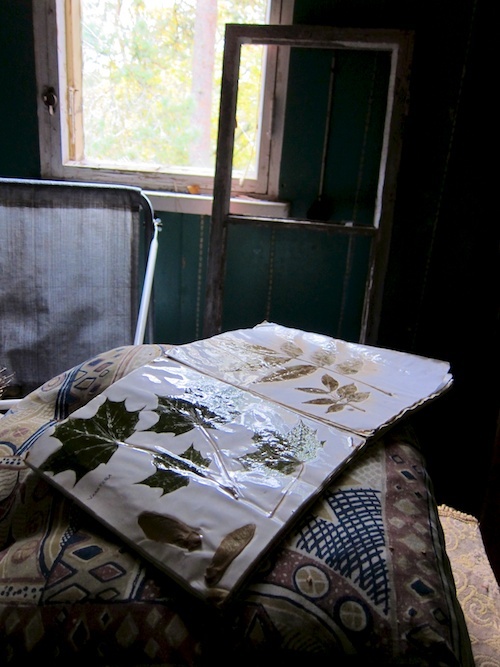 Some of the places that had been intact had been broken in to, which gave us an access too. 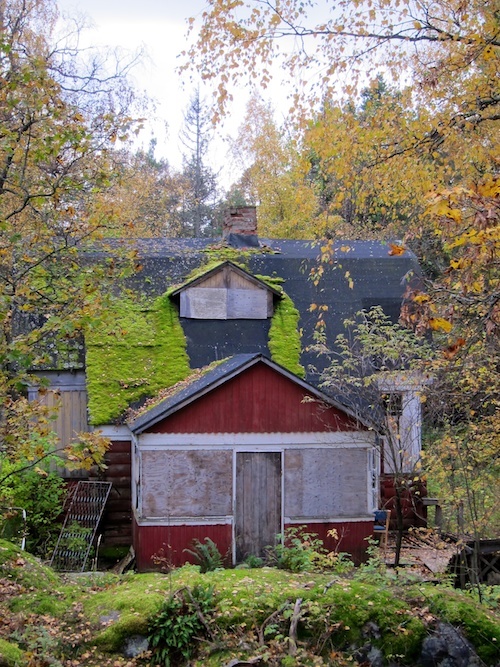 Susi and I fell in love with one of the houses, which may still be salvageable (although with great cost). It had the most beautiful upstairs room I’ve ever seen on an UE trip. 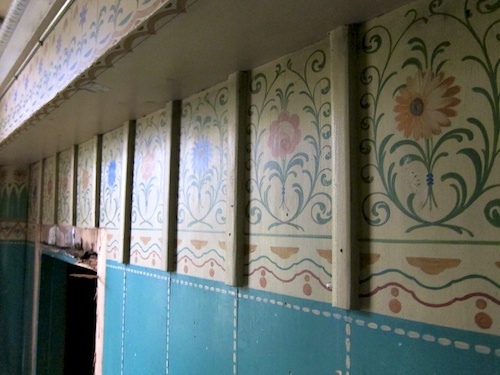 The walls of the house were painted with green and white, and with beautiful plant themed murals. I don’t think I’m ever going to visit that room again, since it’s certain some idiotic teenage shitstain is going to break it up or spray some idiotic tag over the murals. This room was incredibly beautiful. 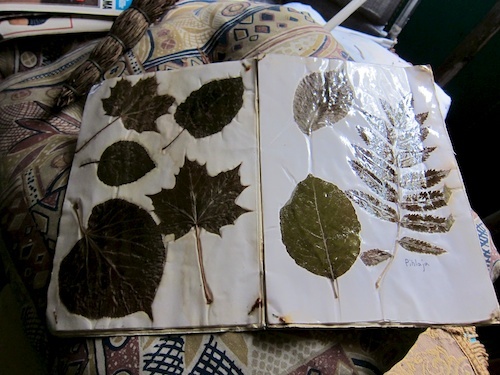 We found some items lying around, such as a schoolboy’s herbarium from the 80’s. The guy who did it is a few years older than I am. We finished the trip by looking for a geocache, which had probably been vandalized, before heading back downtown. It was a beautiful autumn day, with dark clouds on one side of the sky and golden sunlight firing up the turning leaves. Both the beautiful abandoned villas and the nature around the area left me feeling totally recharged and serene. Just what I go looking for on an UE trip. And what’s best, there are still several villas in the area I haven’t seen. This house might've been salvageable.